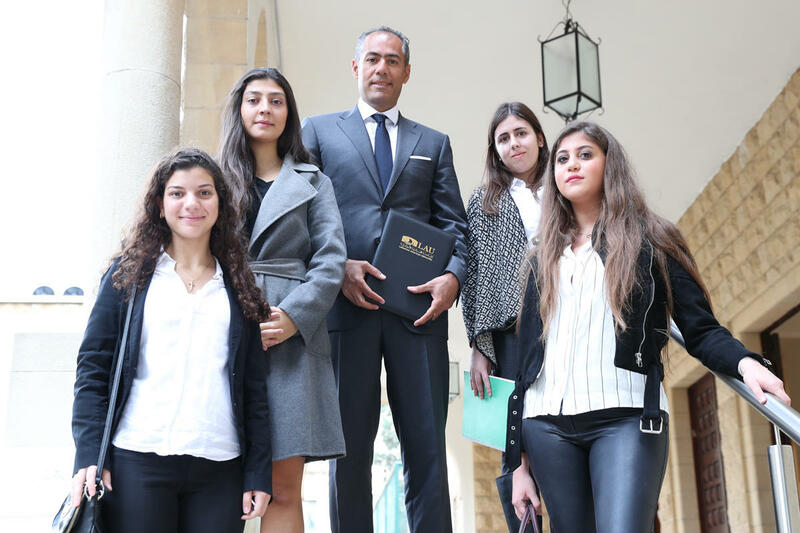 Four business students had the opportunity to meet with LAU alumnus and new donor Wissam Moukahal to show their appreciation for his generosity. Wissam Moukahal with the first students who will benefit from the Rafeek Program Scholarship. Moukahal listens intently to a student in the presence of AVP for Development Nassib Nasr (L) and AVP for Alumni Relations Abdallah Al Khal (C). In conversation with President Jabbra. Moukahal was glad for the opportunity to give back to his alma mater. LAU alumnus and Forbes Middle East Top-100 Executive Wissam Moukahal (BS ’95) has made a generous first-time donation to the university that is helping four students pursue their academic dreams this semester. To make it official, Moukahal made a visit to his alma mater’s Beirut campus for a gift signing ceremony, and to meet with students benefiting from his donation. 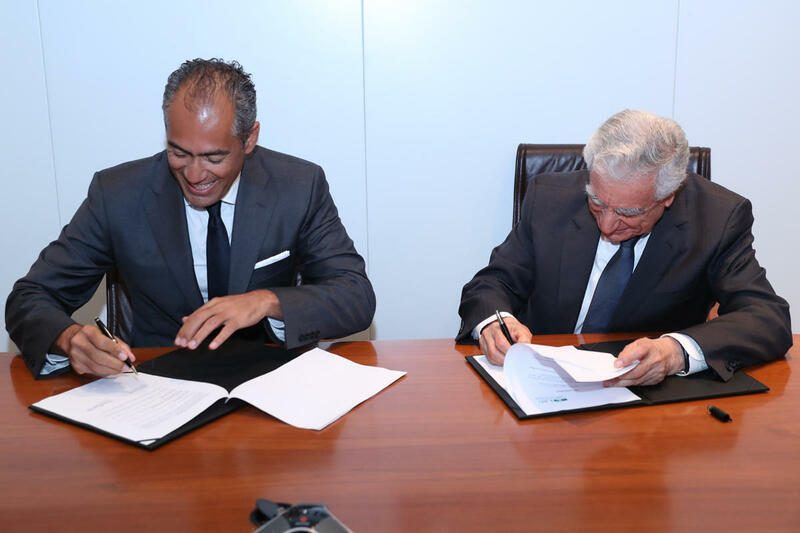 Contributing through the Z. Moukahal Foundation, a charitable organization he founded, Moukahal has established the Rafeek Program Scholarship at LAU, which will cover 25 percent of the tuition of deserving students who are pursuing degrees at the Adnan Kassar School of Business. 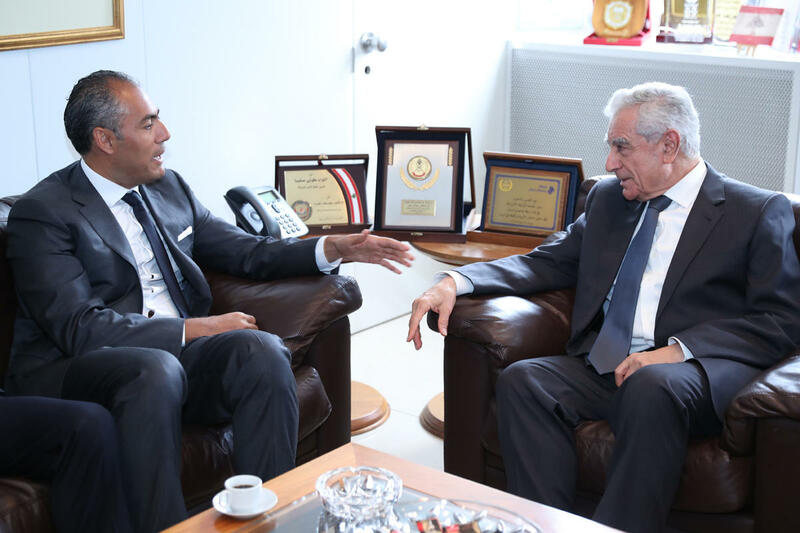 Moukahal attributes much of his career success to his time at LAU, which was a driving force behind his generous gift. Another impetus was his own student journey, which was marked by severe financial difficulty. He overcame it thanks to a combination of support from LAU and his extended family that allowed him to pursue, and ultimately complete, his education. As Moukahal explained during his meeting with university leaders and scholarship beneficiaries, financial hardship was an astonishing and uncomfortable situation for him – the son of a prominent real estate developer and contractor. When his father suddenly went bankrupt during his son’s time at LAU, he unexpectedly had to apply for financial aid. In addition to a solid education, LAU provided a work-study opportunity for Moukahal, which he says played a pivotal role in his professional development. “LAU’s financial aid program was transformative, and it was way beyond financial support. It taught me discipline. It helped me transition to real life and start my career with the right mindset. Because of this, I was way more advanced than my counterparts when I started my first job,” explained Moukahal of his two and a half years working at the university’s Guidance Office. Student beneficiaries of the Rafeek Program Scholarship could relate all too well to Moukahal. Many of them take on work-study jobs at the university, as well as off-campus employment to make ends meet. With a strong affinity for LAU, it was an Abu Dhabi Alumni Chapter event last year that facilitated Moukahal’s gift to his alma mater, as well as forge even closer ties between him and the university. LAU students and alumni are encouraged to be part of the university’s Mentoring Program. To learn more about how you can become a mentee or mentor, please click here.